Ansonia Clock Co. Royal Bonn clock, "No. 500", ca early 1900\'s. 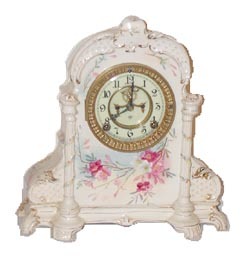 It is my understanding that many of the Ansonia porcelain clocks were never named. If there was no name on the back of the case, they just called it, "that red clock", or whatever. When Tran Du Ly published his Ansonia Clock Co. book, he had to assign numbers to those clocks without a name, so people like you and I would know what clock we\'re talking about when we buy or sell one. Smart idea. This clock came out of the same display case as the previous clocks, and is very clean and nice. It has some tiny chips on the feet that have been covered with paint. Case is cream, with flowers that are primarily pink, some green and blue leaves, shading, and gold accents as usual around the edges. Above average size at 13 inches high, 12 inches wide. Ly-Ansonia No.2659.